The Bobcat Chronicle: Misty's Coming Back! 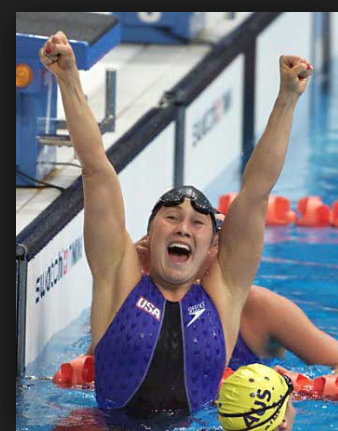 2000 Olympic Gold Medalist Misty Hyman is coming back to Bates! After a successful and fun experience in July working the Bates Swim Camp she is excited to return and not only work with the swim team, but give a motivational talk to all the student athletes on campus! "I'm not the person I am because of the gold medal I have in my pocket," Hyman told a lecture hall full of swim campers Tuesday at Bates College. "I'm the person that I am because of everything it took to get there." 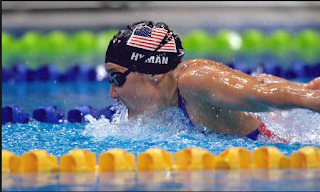 Misty Hyman said the memory of her historic win at the 2000 Olympic Games still plays out like a movie – an unbelievable story along the lines of Miracle. Her opponent was virtually unbeatable, although Hyman had come close a couple of times in the months preceding the Games in Sydney. Susie O’Neill, an Aussie darling, was the odds-on favorite to repeat as 200 butterfly champion – and pretty much everyone knew it. So when it came time for the reigning Olympic champion to face off against her American rival, Hyman had the deck stacked against her before she even dove into the water. “Waiting around for finals was the hardest part,” said Hyman, recounting the night of her Olympic finals swim. “I was incredibly nervous. I remember my hand was shaking as I put my towel in my bag. I think at some point I knew I had to choose to either be so nervous that I would just drop dead or let go. Gillett and Richard Quick, many times. Hyman used that positive energy and her tremendous skill to upset O’Neill and win the 200 fly in an Olympic and American record time. At the time, her win was heralded as a major upset, almost on par with the U.S. men’s hockey team’s victory over the Russians at the 1980 Olympics. Now, 13 years later, it’s still considered a major upset, but for Hyman, who continues to be recognized for her win and is asked to speak about her experience at swim clinics and corporate events, it became a defining moment in her career. “Everything happened effortlessly and automatically, almost as if it were in slow motion,” Hyman said. “I felt that I could have swum a 400m butterfly that night. The best part of the race was making the last turn. I knew I was in the lead and that I had enough gas in the tank to make it home! Since her monumental swim, Hyman’s life has seen its share of ups and downs. She returned to the Olympic Trials four years later as one of the favorites to make her second Olympic team (she came close in 1996 but finished third in the 200 fly) – but it wasn’t meant to be. The August after the 2000 Olympics, an MRI revealed a torn labrum in her left shoulder and she went in for surgery. While successful, Hyman was unable to train her stroke without pain for over a year. After graduating from Stanford in 2002, she returned to Phoenix to train in earnest for 2004 – believing she could pull it off despite limited training and racing but deep down knowing it would be very difficult. “I was still limited in the amount of fly training I could do until my shoulder started hurting,” Hyman said. “I was working with great doctors and trainers in Phoenix, and by the end of 2003, my shoulder was feeling close to 100 percent. I didn't know it then, but it was just a bit too late. Those plans changed a few months later when Hyman went to compete at the U.S. Open in San Antonio. belong there anymore. She swam the first day of the meet but couldn’t get up for her races. Her times reflected her apathy – although later, she agreed it wasn’t apathy but a true sense of satisfaction and fulfillment. For the next few years, Hyman lived on the island of St. Croix in the U.S. Virgin Islands, making new friends, swimming open water and working for The Buccaneer Resort overseeing the planning of weddings and corporate outings. What was originally supposed to be a three-month internship turned into a three-year opportunity. Hyman left St. Croix in 2007 to work on her MBA in finance and hotel management in Switzerland. She also did some traveling and enjoyed being a student without the pressures of finding a pool. While she was completing her research, she started getting requests for technique help and other coaching, clinics, and speaking opportunities, and quickly found her re-entry into the sport she started as a child to combat her asthma. Today, Hyman continues to live in Arizona, coaching privately at the Sanctuary Resort in Paradise Valley. She works mostly with competitive swimmers to improve their technique and racing skills, but also works with resort guests, triathletes and fitness swimmers. She also volunteer-coaches once a week with her high school team and travels frequently with the Mutual of Omaha Breakout! 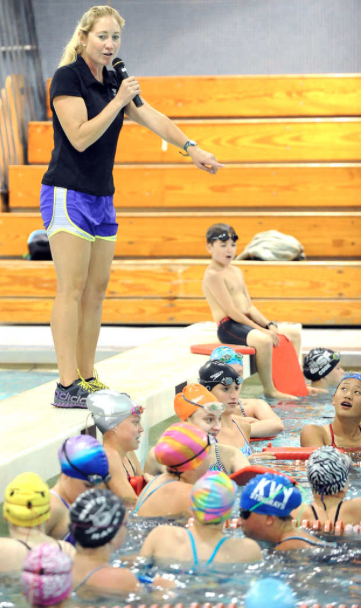 Swim Clinics as well as to give motivational speeches. “I am very involved in the community that I grew up in,” Hyman said. “I am the spokesperson for a program called Fit Phoenix that was put together with our Mayor, Greg Stanton, and City Councilman Daniel Valenzuela to promote and improve health and wellness in our city. “In addition, I am on the advisory board for a wonderful local nonprofit called Gina's Team that brings life skills to women in prison and helps them transition into society when they get out. I have been to our women's prison many times to give a seminar on goal-setting, and I have visited several of our juvenile facilities as well." And as for her famous swim? It’s become part of her – something she’ll always have regardless of where life takes her – in and out of the water. I hope your motivational speech helps many particpant this year as well. It is always a great push from peers that can lead to something so big!